She is ready to be there to support Richard on Catherine's operation day. brings Richard tells her to go see Thatcher whose time is nearly up, so she goes reluctantly. Richard, Jackson, and Harriet visit Catherine. Amelia and Tom go over their plan to treat Catherine. Thatcher's aid leaves him and Meredith alone together after recognizing who she was based on the many pictures that Thatcher had. Meredith doesn't want to talk at first, so she asks if she and her father can just sit there. Catherine is the OR. She and Jackson talk about their first surgeries, and she talks about her favorite song that she uses. She wants him to sign paperwork and get her affairs in order. Thatcher tells Meredith about the time he spent in Zimbabwe. He tells her about his life after the surgery, and she tells him that he always runs. They have it out expressing themselves, but he ends up feeling sick, so she helps him to the bed. They talk about Ellis and share their memories. He tells her that he was at Derek's funeral even though he didn't approach her. She tells him about Maggie. They talk about Lexie, and as he's getting worse, she tells him about her kids. He tells her that he has gifts for the kids in the closet. As she's talking about her children, he passes away while she's holding his face and talking to him. Later, she brings the gifts to the kids and tells them that they came from their grandfather. Amelia and Tom rehearse what they are about to do on Catherine, both pretending to be confident, but Tom isn’t feeling it. Amelia does her word bomb thing to see if it helps. He admits he can't lose Catherine, and Amelia assures him that they won't. Catherine is bossing around everyone in the OR. Jackson plays her favorite song for her and everyone dances. Catherine and Richard have a moment of privacy together. During the surgery, Tom is still singing. Jackson can't take watching the surgery though, so he goes outside. Maggie talks to Richard and then follows him to comfort him as he breaks down and talks about his mother. During the surgery, Tom realizes that he has to go in from a different angle and they have to flip Catherine. They decide to do it even though it's risky. It works, and they keep operating, but they have to get all of cancer. Richard offers his project that he was working on, and they use it. Catherine survives, but they couldn't take all cancer out. She's still going to need chemo and radiation. Tom is upset that he couldn't get it all, but Catherine is thrilled that even though she'll have cancer for the rest of her life, she's going to live a long life. Teddy who encouraged Tom earlier offers to buy him a drink. He takes a raincheck and goes to the chapel to talk to his dead son. Amelia goes to an AA meeting and speaks about her experience and how thrilling it was to feel it while sober. Tom: It's fun having so many surgeons in one family. Tell me, Avery, when did you become board certified in Neurology? Jackson: Is this really how you talk to your patient's family? Permalink: It's fun having so many surgeons in one family. You're going to do great, you and Amelia. You're ready. Permalink: You're going to do great, you and Amelia. You're ready. 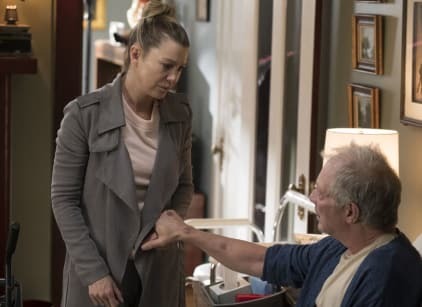 Grey's Anatomy Round Table: Emotional Triumphs and Farewells!